Real Plans has some awesome features to help you set up your Whole30 Meal Planner to meet your specific meal-planning needs, making it much easier for you to follow your Whole30 to completion. Head to Settings > Whole30, and look for “Filters” in each meal slot. 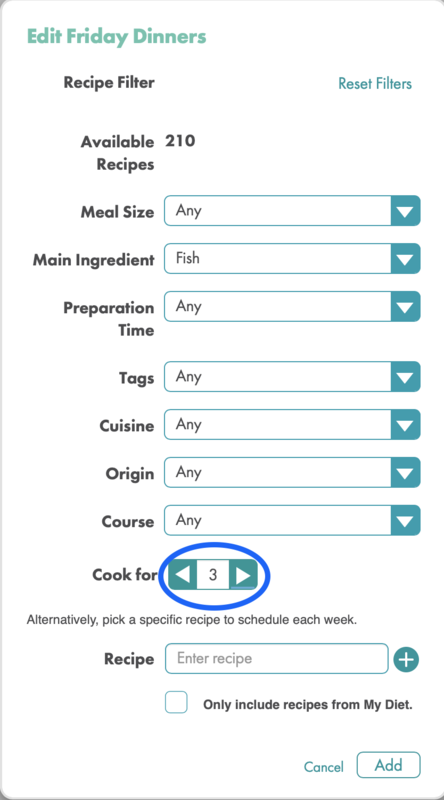 To do this, make sure all dinners are turned on (green), click on the Filter for each day’s dinner, press the plus sign to up the serving size to the desired number to have enough for tomorrow’s lunch, and click “Add”. 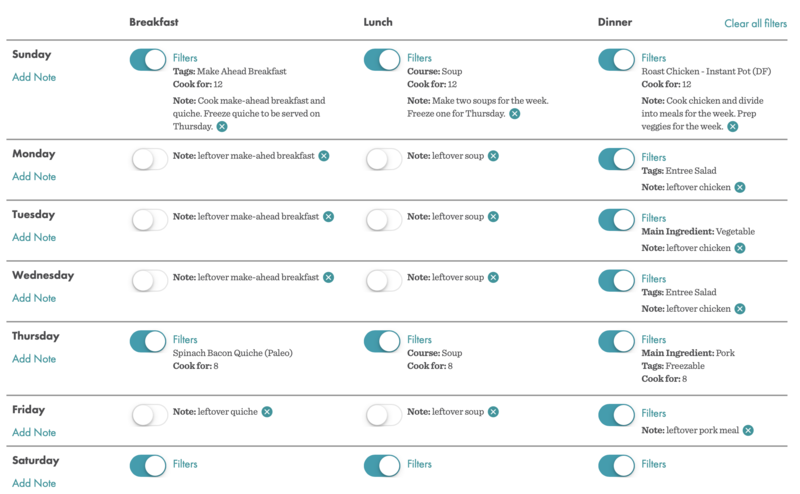 Turn off the lunch meals that you will be having leftovers by sliding the toggle from green to white. Click on “Add Note” under each day you wish to eat leftovers, choose “Lunch”, and type “leftovers”. Click “Add”, and the note should now appear on that day’s lunch. Be sure to click “Save my Whole30” so these changes will be applied to the meal plan. The schedule should now have extra dinner servings to allow for leftovers for lunch everyday. First, make sure you have your slow cooker and/or pressure cooker Equipment Settings turned on (click here to see how). Then, go back to Settings > Whole30, select “Filters” for the day of the week a pressure cooker or slow cooker meal is needed, select “Tags”, and choose pressure cooker or slow cooker from the dropdown. 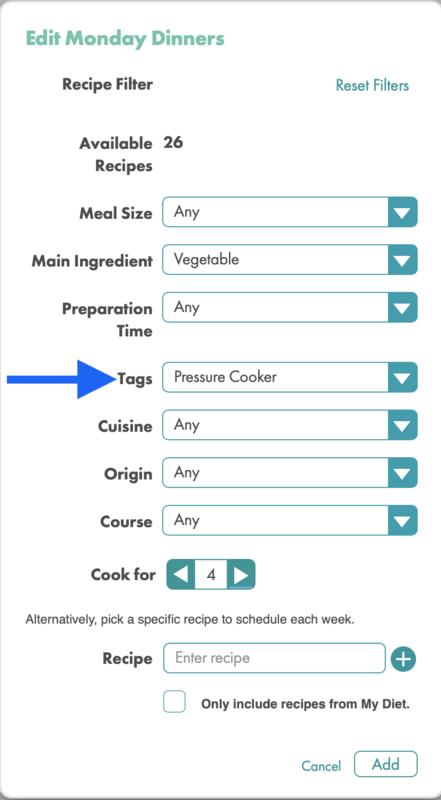 Other options in the “Tags” category that are particularly helpful during your Whole30 are Simple, which includes recipes that use fewer ingredients and take less time to make, Make-Ahead Breakfast, Freezable, and Kids, which might have more familiar ingredients and be less complicated to make. You can also create your own tags to use for scheduling in the Filters. 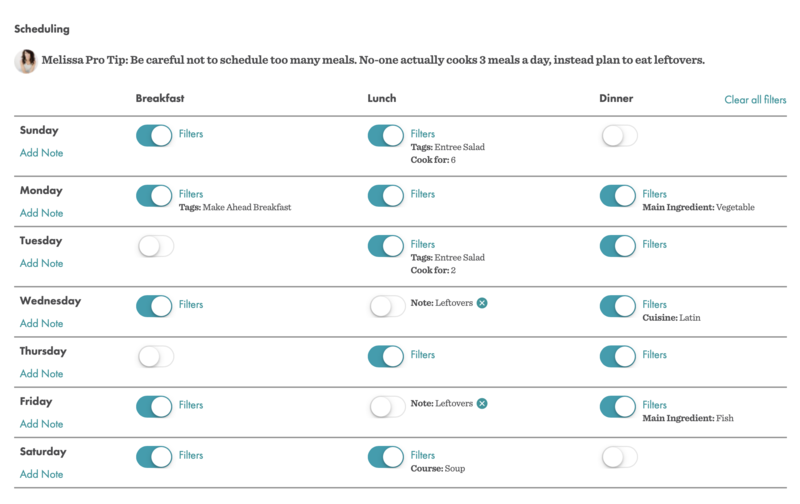 Select the desired day for breakfast from the scheduling template and select Filter > Prep Time > Less than 15 or Less than 30. You could also schedule a specific breakfast that is quick to prepare, like scrambled eggs, to automatically populate. The “Make-Ahead Breakfast tag is also a good option for having your breakfast cooked ahead of time, so all you have to do is heat and eat. For packable lunches, choose specific recipes that are portable, or select soup or salad as the course since those items can be easily transported. You can also create your own “packable lunch” tag to apply to recipes that work for you, and you can then schedule those using the Filters. Dinner leftovers make great packed lunches, too, and can be scheduled as described above. There are a few different ways you can accomplish this. You can take a look at the meals on your Meal Planner and use our notes feature to make a note showing what prep you wish to do on the weekend days. Alternatively, some people like to move all the recipes to the day they want to prepare them and then make a note on the day that they plan to eat each one. Click here to learn how to make a note on your Meal Planner. The possibilities are practically endless! 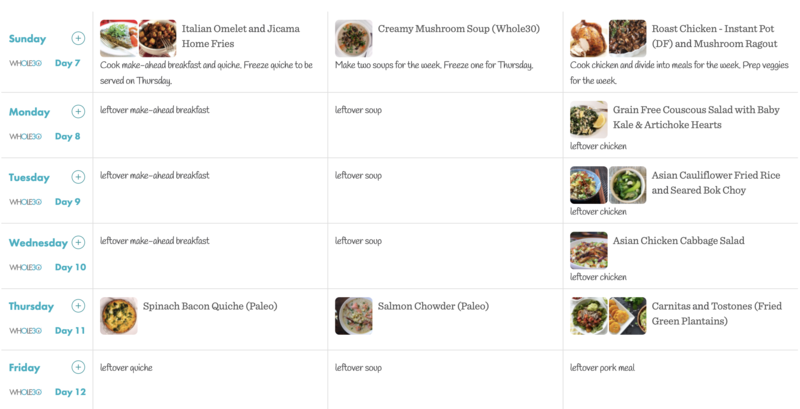 You can use the filters to plan leftovers, choose meals with little prep time, schedule the same recipe to appear every week, or choose which main ingredient you want for each meal (chicken on Monday, pork on Tuesday, beef on Wednesday, etc.) Once the filters are selected based on your Whole30 needs and cooking preferences, Real Plans will generate a totally customized Whole30 meal plan just for you! As always, we are available in chat to help you rock your Whole30!